Sienna Miller's sometime 'brief encounter' with Daniel Craig has been making the news, after the former gave evidence as a witness in the News of the World phone-hacking trial yesterday. Miller and Craig appeared together - and had a fictional brief encounter - in Matthew Vaughn's 2004 London gangster movie 'Layer Cake'. As well as Craig and Miller the film includes Ben Whishaw, Michael Gambon and lots of people who have been in Eastenders and Brookside, all mixed up with cocaine and Serbian ecstasy dealers. 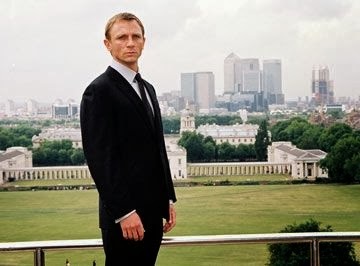 Several of the key scenes of the film were shot in Greenwich Park, where the Craig character meets up with hit men by the General Wolfe statue. Sienna Miller took the role after Patsy Kensit dropped out. Scenes with Kensit were shot in Deptford at the master shipwright's house (where Craig had filmed Sylvia with Gwyneth Paltrow) I'm not sure whether the re-shot scenes with Miller at Deptford made it into the final edit. I remember thinking at the time that we had to be careful not to mention to Sienna Miller that Jude Law had been at the house a few weeks before for Dunhill. Kensit was going through her own crisis and was refusing to leave her trailer to film her scenes, hence the role went to Miller. I've watched this film. Great actors and great filming locations. Layer Cake is one great film!